Achieving a thick texture that is rich in color, blending, building surface texture, edging, detailing and scraping off layers of paint are the main goals of palette knife painting. Vincent van Gogh used his palette knife painting to capture and convey raw emotion. His immediate sweeps of swirling concentrated colors applied with thickened paints continue to capture the imagination of museum-goers worldwide. Palette knife painting works best with impasto painting, or with thickened paint. Palette knives come in a variety of shapes and styles. They are usually steel blades with wooden handles. The better the knife, the further the metal extends through the handle. There are three main types of knives: a symmetrical knife that has a rounded tip, which is good for mixing paints, a knife that is symmetrical with a pointed tip, which can be used for details and sharp edges, and an asymmetrical knife that has a pointed tip and is diagonal on the end. The asymmetrical knife can be used to apply paint, scrape paint off (which is called "sgraffito") and even clean excess paint off of a palette. Palette knives have a crank or bend in the handle. This is to protect the painter from getting knuckles covered in paint. It is best to wipe paint off of a palette knife in between each application so that it is clean and colors do not blend unintentionally. Both acrylic and oil paint are appropriate for use with palette knife painting. Oil paint straight from the tube is thick enough to work with, though stand oil can be added to make the paint easier to apply. Sand and sawdust are also materials that can be added to oil paint to make it thicker and add variety to the final textures on the surface of the painting. Acrylic paint has more flexible mediums that can be mixed in with colors to create various types of textures. Golden is a common brand that has made mediums that will alter the texture of acrylic paint with minimal changes to the color. Some of their mediums contain tiny glass balls, sand-like substances, stiffener to retain peaks for a three dimensional look and a variety of other pastes that all have different results. Their mediums are flexible to prevent cracking and flaking. Oil and acrylic paints can continue to be built up with several layers, allowing each layer to dry prior to adding more paint. The thicker the paint, the longer the drying time will be. There are several methods to apply paint to a canvas or board using a palette knife. Dipping the edge of a palette knife into paint and then dragging the point across the canvas will create very fine lines for edging or detailing. Palette knives are typically used to blend paint on a palette, which creates smooth colors. For a bolder look, blend colors directly onto the canvas with a knife. Impressionistic effects can be created with small dabs of paint applied quickly with the end of a knife. Using a knife with a pointed blade or a narrow tip to paint in light, fast strokes while overlapping color will also contribute to an impressionistic feel. To create large sections of thick texture, load up a large blob of paint on your knife and press it down onto the canvas. It can be smoothed out as if icing a cake to cover large areas. Paint can also be squeezed directly onto the canvas and smoothed out with a knife for coverage. To attain a quick texture, load the knife with paint, press it against the canvas and pull up. Small ridges will remain behind. Sgraffito, or scratching into the paint, can be created by spreading paint onto the canvas and using a sharp tip of a knife and scratching into the paint, removing it to reveal the under color. 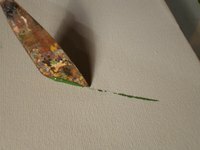 Effects can easily be altered depending on how much paint is used on the palette knife and how much pressure is being applied while moving the knife over the canvas. Starting with a thick line and altering the pressure from heavy to light, will create motion and interest in your painting. How Does Art Express Emotion? What Is the Visual Texture and Actual Texture in "Starry Night?" How to Paint an Interpretation of Van Gogh's "Starry Night"